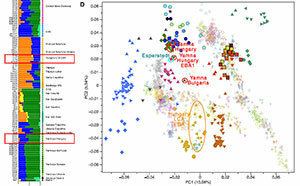 An interesting open genomic question is the origin and spread of Caucasus hunter-gatherer (CHG) ancestry in steppe populations during the Eneolithic. 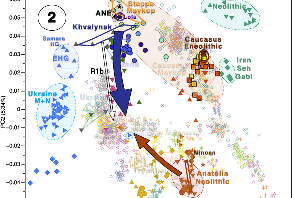 The assimilation of a previous steppe population during the formation of the early Khvalynsk – Sredni Stog I cultural-historical area. 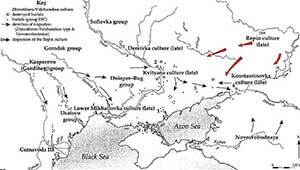 Genetic flow from migrations, mainly a westward expansion of Suvorovo-Novodanilovka Chiefs from Khvalynsk, and potential back-migrations. 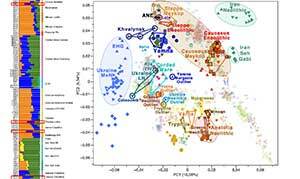 Innner genetic flow among steppe cultures in close contact. Plant food subsistence in the human diet of the Bronze Age Caspian and Low Don steppe pastoralists: archaeobotanical, isotope and 14C data, by Shishlina, Bobrov, Simakova, et al. Veget Hist Archaeobot (2018). EDIT (16/3/2018): You can now read or download the paper at Academia.edu. The paper presents the result of analysis of charred food on the interior part of the vessels from the graves of the East Manych and West Manych Catacomb archaeological cultures (2500–2350 cal bc). The phytolith and pollen analyses identified pollen of wild steppe plants and phytoliths of domesticated gramineous plants determined as barley phytoliths. 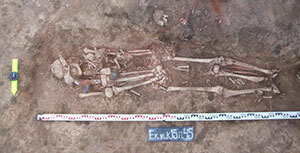 Direct 14С dating of one of the samples demonstrates that barley spikelets and stems were used in funeral rites by local steppe communities. However, there are no data suggesting that steppe inhabitants of the Lower Don Region were engaged in agriculture in the mid-3000 bc. Supposedly, barley could have reached the steppes through seasonal migrations of mobile pastoralists to the south, use of North Caucasus grasslands in the economic system of seasonal moves and exchange with local people. 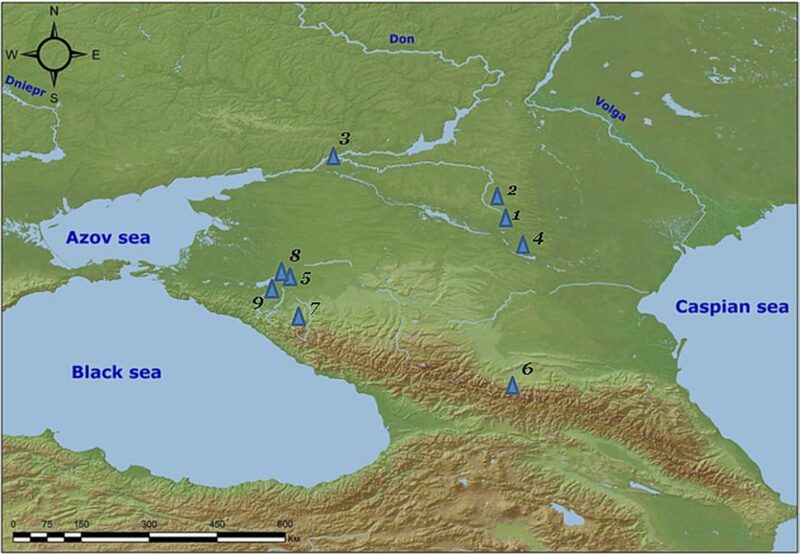 Nevertheless, presence of carbonized barley seeds in the occupation layers at North Caucasus settlements of 4000–3000 bc requires confirmation by direct 14С dating of such samples. Dynamics of Chemical and Microbiological Soil Properties in the Desert–Steppe Zone of the Southeast Russian Plain during the Second Part of the Holocene (4000 BC–XIII century AC), Kashirskaya, Khomutova, Kuznetsova, et al. Arid Ecosyst (2018) 8(1):38-46. 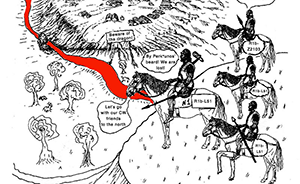 The results of studies of the chemical and microbiological properties of the soils buried under the barrows of the Eneolithic, Bronze, and Middle Ages periods of the southeast of the Russian Plain are presented. 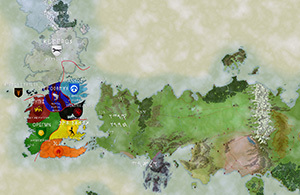 It was shown that the climate of the region in the Eneolithic period (4200–4100 BC) and in the Middle Ages (700 years ago) was more humid in comparison to the present time. The third millennium BC was characterized by a gradual increase of the climate aridity. 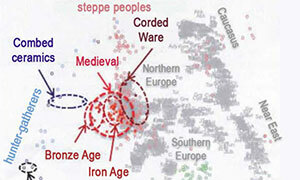 Its peak was at the end of the III millennium BC. The number and biomass of microbial cells was maximal in soils buried in periods of high atmospheric humidity (4200–4100 and 3000–2800 BC) and sharply decreased during the aridization period in the second half of the III millennium BC. In general, the variability of indicators of microbocenosis conditions of desert–steppe buried soils of all ages from the burial mounds correlated with the centuries-old dynamics of the climate. Number of microbial cells in buried soils of different ages and modern background soil. 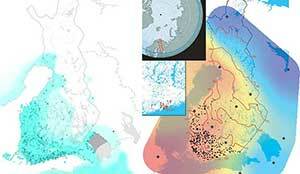 It is well known that access to more food – as in favorable crops and cattle feeding – may cause demographic explosions, and the second article – together with recent genomic data – may be yet another proof of that. 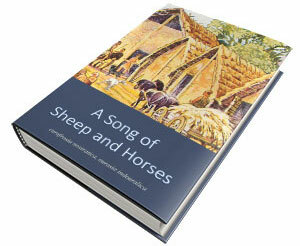 Until now, pastoralism seemed to be the main subsistence economy for most steppe groups. 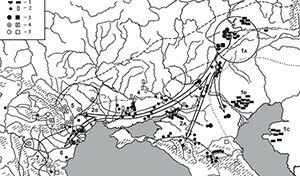 It seems that earlier Eneolithic contacts of certain steppe groups with settlements of the Northern Caucasus might have been not just to obtain prestige goods though, but – if proper radiocarbon dating confirms it – also implied essential goods, and maybe more stable seasonal exchange systems. Such stable economic exchanges might have therefore included bidirectional exogamy practices, justifying the sizeable genomic contribution from the Caucasus. At this point this is just another good theory to take into account.